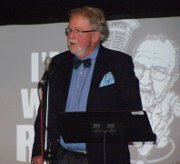 Rafe returned to radio on December 5, 2016, as a guest on The Goddard Report. Topics discussed were the Kinder Morgan pipeline, and the Liberals’ unwillingness to move on electoral reform. Click here to listen.